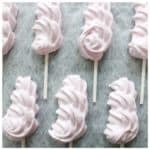 So many of you have been commenting on how to make theses darling little meringue pops and I have just been trying my best to fit in some time in the kitchen this past week. 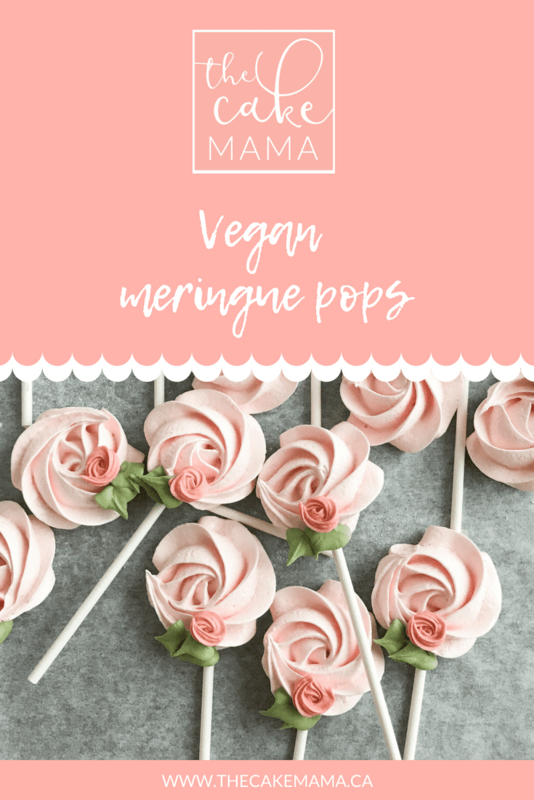 When I originally posted the photo of meringue pops to my Instagram feed, our family wasn’t entirely plant based and I honestly didn’t have time to experiment with a recipe when the order for these little treats were due. 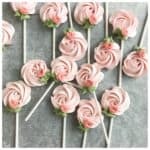 So, I think it’s only fair that I share my recipe for BOTH vegan and egg white based meringues so you can truly yield the same results as I did! The biggest difference between the two recipes is how well the meringue can hold it’s shape while piping. 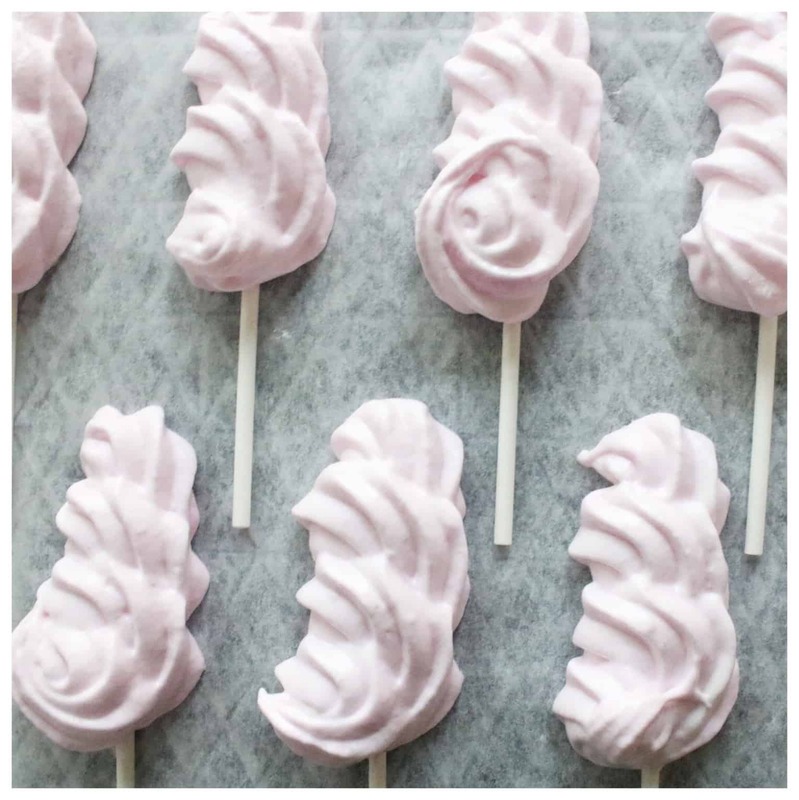 An egg white based meringue (top rosette meringue pops) will have the stiffest peaks and therefore hold its shape much better than a vegan recipe (bottom swirl meringue pops). Just putting that out there right now so you don’t get disappointed when your meringues don’t turn out the same way when you make them vegan. The TASTE however, is equally as delicious and if you’re allergic to eggs, the vegan recipe is perfect for you. The humidity and altitude of your location will affect the consistency of your meringue (either vegan or egg) so please start off by trying the recipe exactly and playing around with it afterwards to adjust it accordingly. For example, the guar gum- you may need less than the recipe calls for to get some really glossy meringues in the vegan recipe. The following recipe is what worked for me! The biggest notable difference in this recipe is that it does NOT call for chickpea brine. 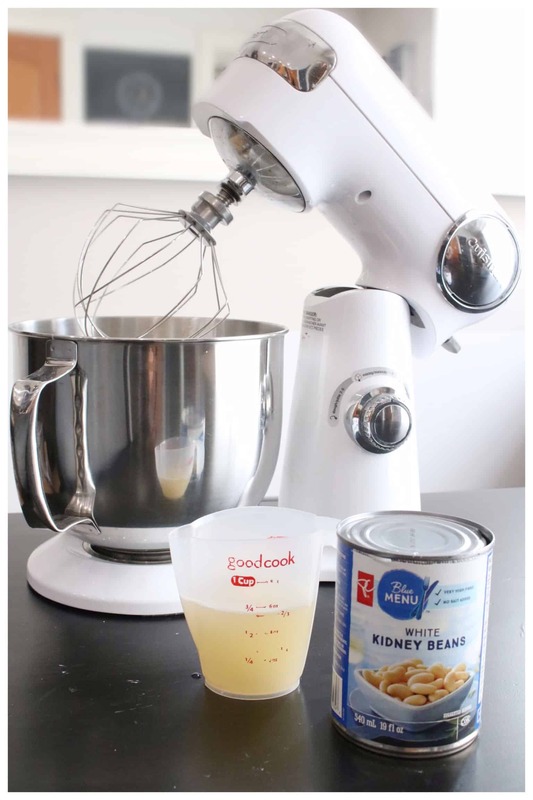 Instead, this recipe calls for unsalted white kidney bean brine and one 540mL can will yield the exact amount of brine you require for the recipe. I find the flavour of kidney beans is masked much easier with flavouring versus the chickpea brine. 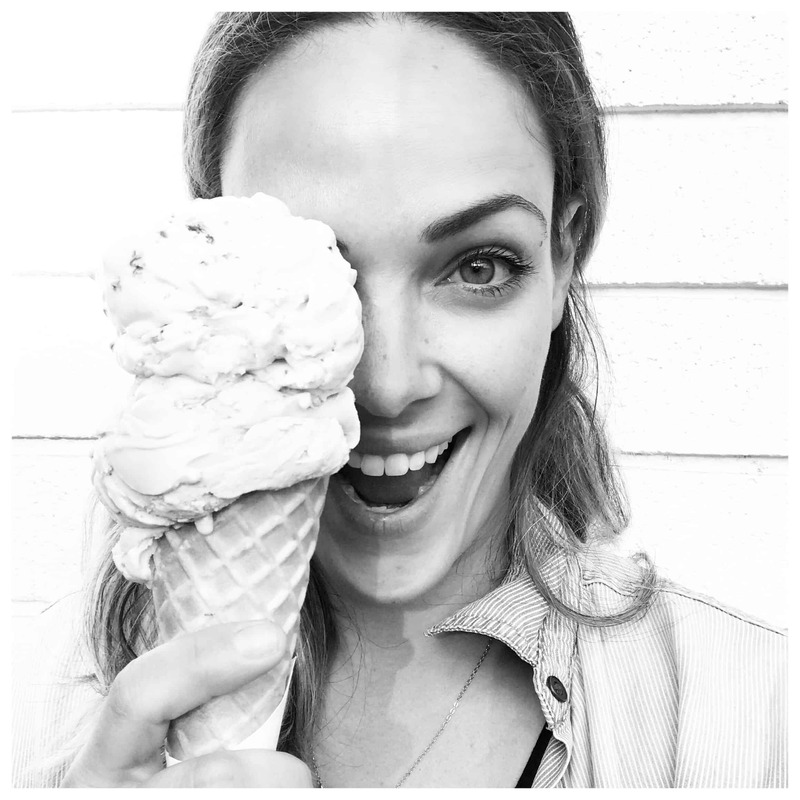 No matter how much flavour you add, the nutty/beany flavour comes through. Another plus is that white kidney bean brine is much thicker, therefore it creates a thicker consistency than aquafaba (chickpea brine). 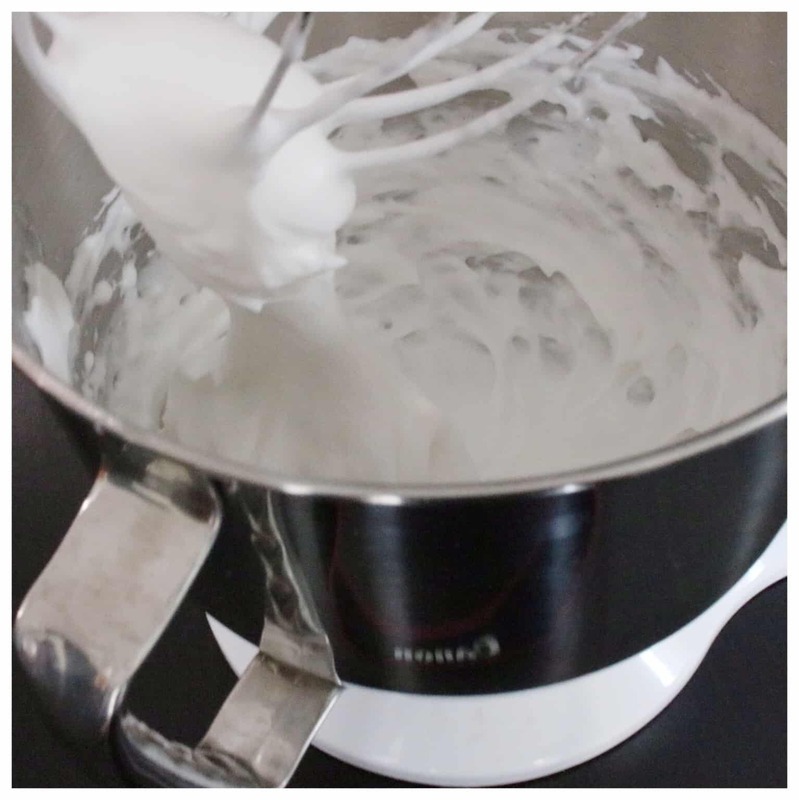 With the whisk attachment, whisk together at high speed the brine, guar gum and flavouring for about 10-15 minutes until mixture resembles the glossy texture below. When the mixture has thickened and stiff peaks occur, gradually add the granulated sugar until combined. Mixture should grow in volume slightly. Take care to work quickly so your meringue doesn’t begin to deflate. 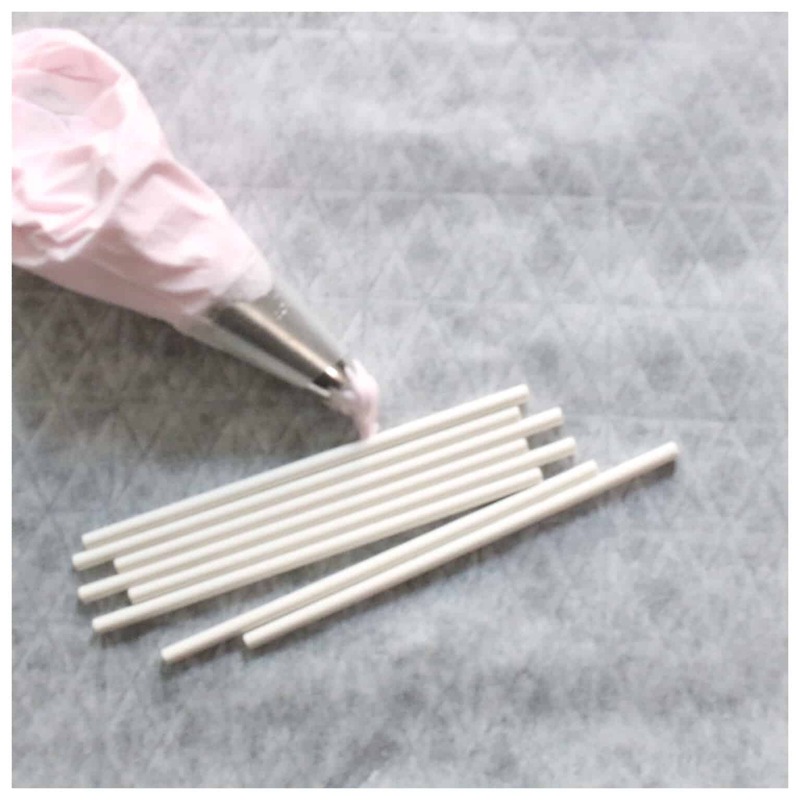 With a 1M piping tip in a piping bag, spoon the meringue into the bag and pipe over paper lollipop sticks on parchment. 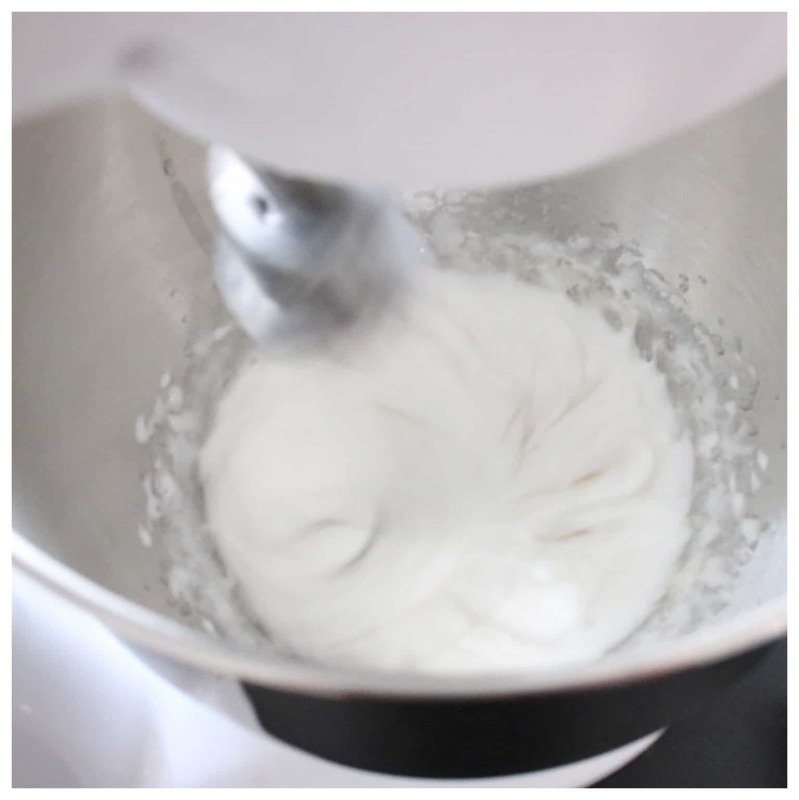 Swirl the piping bag in a circular motion and swipe away to break off the tail from the piping bag. Bake at 200*F for 2-3 hours in an oven or a food dehydrator until meringues are hard to the touch. Allow to cool completely before packaging and storing in an airtight container. If your area is humid, you may need to bake longer. DO NOT STORE MERINGUES IN THE FRIDGE. They will become a sticky mess. If you find that your meringues are starting to get tacky, place them back in the oven on a cookie sheet lined with parchment and bake at 200*F for another hour. I hope you enjoy this recipe and please let me know what you think! 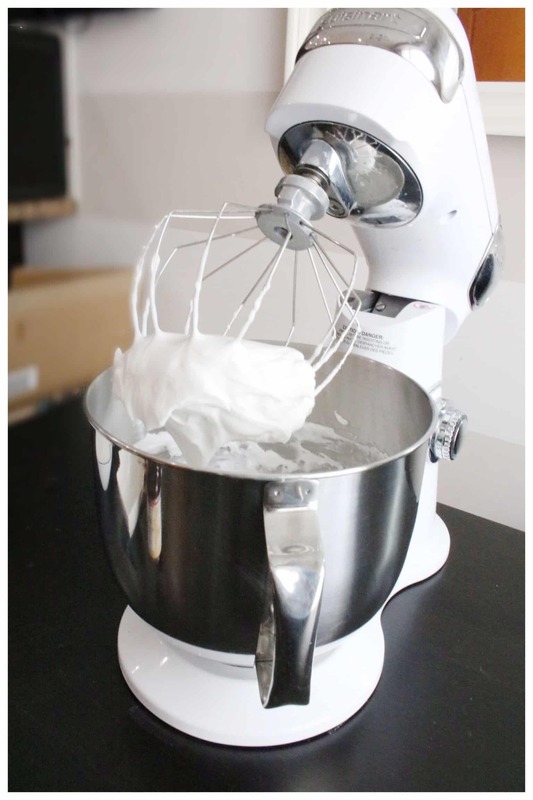 In a mixer with the whisk attachment, whip egg whites and cream of tartar until stiff peaks form. Gradually add the granulated sugar, about 3 tbsp at a time until completely mixed. Mixture should be glossy and not gritty. Slowly add the vanilla extract with mixer on high and mix just until incorporated. Spoon meringue into piping bag fitted with 1M tip. Line cookie sheet with parchment paper. 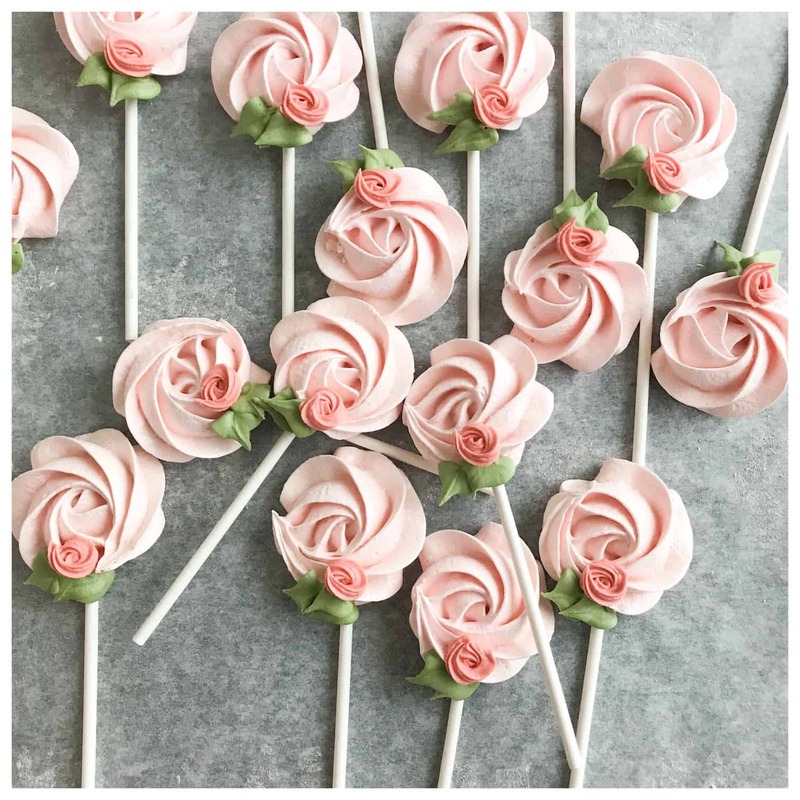 To make a rosette, start with a star pipe directly onto the paper lollipop stick (on parchment) and continue to swirl in a clockwise motion until you come back to the start. Swipe piping bag away to break off the meringue. Bake at 200*F for 2-3 hours or until meringue is dry to the touch. It is important to use a weigh scale to weigh your sugar. The meringue recipe itself is simply a ratio of 1:2 egg white to sugar. 1 large egg white is roughly 30g so you can adjust your quantities for sugar based on this. With mixer still on high, gradually add sugar taking care to work quickly to incorporate. Mixture will be slightly gritty, this is ok.
Add food colouring if desired. Spoon meringue into piping bag fitted with a 1M piping tip. Line cookie sheet with parchment and pipe swirl in circular motion over paper lollipop stick. To achieve the rosette style, start by piping a star over the top of the stick and move in a clockwise motion creating a full circle. Swipe piping tip away from rosette to finish. Bake meringues at 200*F for 2-3 hours or until meringues are dry to the touch. Store in an airtight container for up to 1 week. To finish off, you can also add sprinkles before baking. 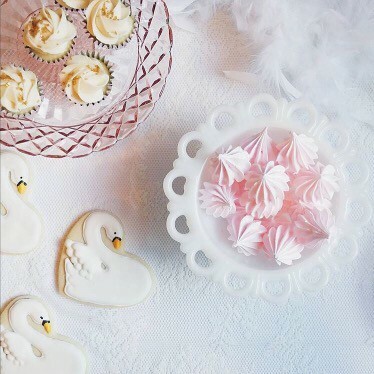 You can also add royal icing designs once the meringue has been baked. 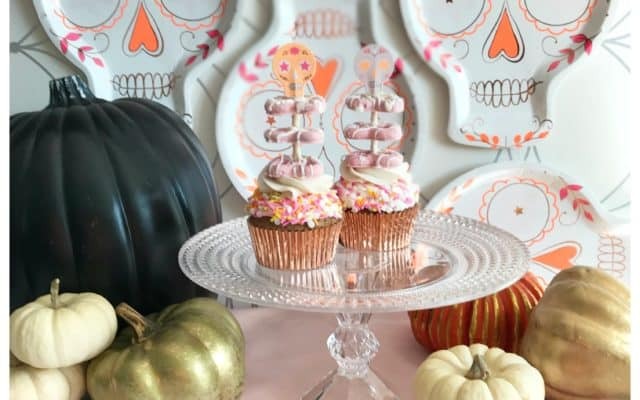 I Made It: Sugar Skull Cupcakes!